Of course I’d love to make all of my holiday gifts by hand, but since I usually have only five minutes a day to craft and so many presents to give, I think I may have to rely on the craftiness of others to help me through. 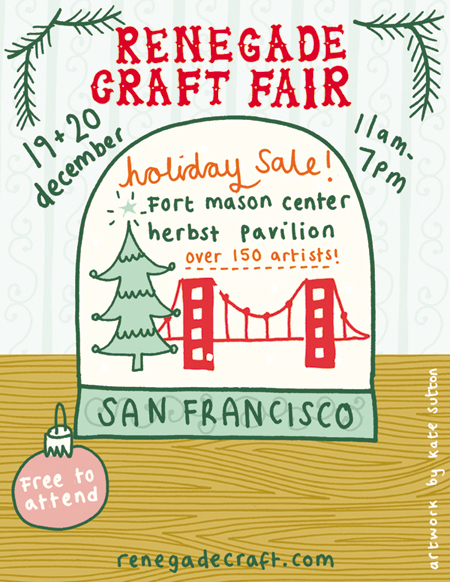 Which is why I plan on going to this year’s Renegade Craft Fair next Saturday. BooYAH! Heck, if I can’t craft, then I’d like to support other crafters whose ingenuity and appreciation for hand-made makes my world and theirs better. Hey lady — Let me know if you would like a date for the fair. Sounds like a delightful way to spend some time with my favorite craft queen. Wished I’d gone to Renegade Craft. Previous Previous post: Happy Birthday Melinda!